Relatively little is known about the portrait and figure engraver W.H. (William Henry) Worthington. Born in London around 1795, he published plates in Physiognomical Portraits (1821), Effigies Poeticae (1822), Portraits of the Sovereigns of England (1824), Pickering's History of England (1826), Walpole's Anecdotes of Painting (1827), Hogarth Moralized (1831), Hogarth's Works (1833), and Cunningham's Cabinet Gallery (1836). He is perhaps best-known for engraving the Elgin Marbles for A Description of the Collection of Ancient Marbles in the British Museum (1812-45). Worthington also exhibited original portraits and themes on Shakespearian themes at the Royal Academy and British Institution from 1819 to 1839. For the 1828 edition of the annual The Bijou, he engraved The Abbotsford Family by Sir David Wilkie. 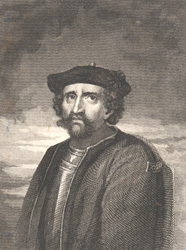 His only other Scott-inspired piece was an engraving of Rob Roy MacGregor 'from an original drawing', quite possibly by Worthington himself (click on thumbnail below).